Next level web personalization technology. The website of the future is about communication. The astoundingly more effective real estate agent website. What if each prospect visiting your site could see more than common, generic information? What if your site visitors could see content that precisely spoke to their exact real estate circumstance and goals? What if they could actually see ongoing content that was as personal as a face to face conversation? Preposterous? Impossible? Actually, no. With I-Square, this outrageous, game changing capability, is breathtakingly simple. Real estate agents all over the country are utilizing it now. While competitor websites are displaying static, generic information, I-Square sites are displaying the type of timely, precisely focused information that turns contacts into clients. The singular difference that changes everything. I-square site: Provides information, forms relationships. The advantages of the internet are obvious: Greater access to information. However, there's a crippling downside. By its very nature, a static, internet website may be the worst platform for developing personal connections, that was ever invented. As real estate is a relationship business, this is an enormous road-block positioned at the center of what real estate is all about. It's the one reason why building a real estate business today, is so difficult. Remove this internet roadblock, and watch your business thrive. Make the connection with the prospect. • They will be dealing with a vacant home. • They are new to the area. • They want a home in South Reno. • They are avid tennis players. Rather than just handing out a business card, provide a personalized web experience that specifically targets their expressed needs and lifestyle. THE SCENARIO: A prospect expresses a desire to buy a home in the exclusive Lakeridge Golfing Community. Win the prospect by providing a web experience that establishes you as the Lakeridge Golfing Community expert! Establish yourself as a specialist. THE SCENARIO: You approach a "for sale by owner" prospect. Most "for sale by owners" end up working with an agent. Rather than just handing out a business card, distinguish yourself by providing a website that speaks to the exact circumstance. GENERATE NEW BUSINESS - with ridiculously powerful marketing capabilities. You can place a unique, personalized squeeze page over any of your website experiences, with a couple of clicks. Define your service to be superior. With most landing pages, the big idea is to be more "eye-catching" than the competition. With I-Square, the content and capabilities of our landing pages conveys to the consumer that you are better. Rather than just handing out a business card, email them a link to a website that specifically targets their expressed needs. THE SCENARIO: A prospect expresses a desire to buy a home in the exclusive Lakeridge Golfing Community. Win the prospect by directing them to a site that shows you are the real estate expert in that community. I-Square's innovative new format, makes the impossible - easy. Astonishingly, all of the web experiences above, featuring different looks, unique information, and focused content, are originating from the same website. Effortlessly provide uniquely targeted information for individual prospects, groups of prospects, developments, communities, or lifestyles. Fact: You would need to own and somehow manage 100 separate websites to do what one standard I-Square site can do! One website for you, multiple unique web experiences for prospects. While I-Square is one website for you, it can morph into any number of uniquely personal experiences for prospects. Each prospect enjoys ongoing web content that is specific to their exact needs. The myriad of advantages is staggering. An I-Square site can do anything an ordinary site can do. Our sites however, have an additional layer of capability that changes everything. While I-Square is one website for you, it can morph into multiple, uniquely personal, communicating sites for each of your prospects. This affords you the fantastic ability to use ongoing web content to speak specifically to each client's exact needs and circumstance! Prospects astonishingly realize your site is all about their specific real estate needs - and no one else. You gain the priceless ability to stand out from the din of competitors. The client-winning impact made by this level of personal focus, cannot be overstated. Run circles around the competition. Switching to a relationship based web presence opens a whole new world of marketing capabilities. I-Square ushers in a multitude of new marketing concepts that are unimaginable with an ordinary website. 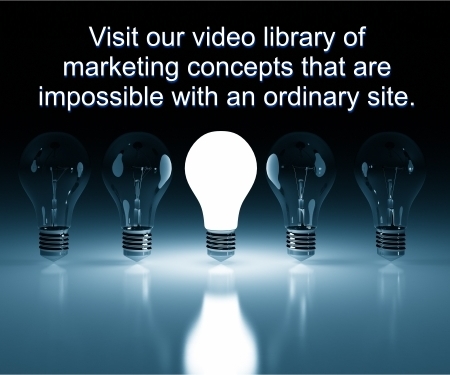 Smartly grow your business in ways that are impossible to achieve with an ordinary site. I-Square is ridiculously easy to utilize. I-Square makes it possible to be a unique and personal agent in an impersonal, internet world. The possibilities are endless. What is utterly impossible to do with an ordinary website, is now breathtakingly simple to do with I-Square. "Real estate is a relationship business. It's not about how many calls you made today, it's about did you connect with anyone." Top real estate producer, renowned real estate motivational speaker and coach. Seriously grow your business with the new I-Square. I don't understand multiple website morphing. More info on websites for Realtors. More info on websites for real estate agents. *Source: National Association of Realtors. 2013 survey.